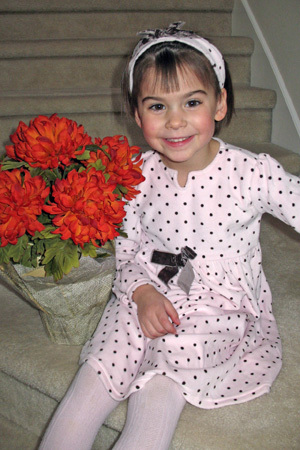 I started my second year of preschool at the Montessori on September 2nd. I was very excited, especially because I am going to be a full-time student this year and so I can eat lunch at school with my friends! 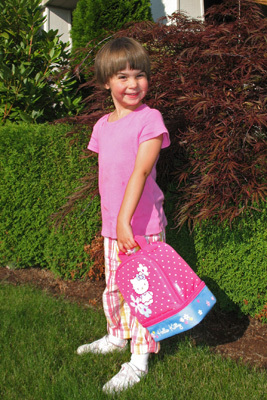 Mommy let me choose my own lunchbox—Hello Kitty [right]! I'm in Apple Class again. My morning teacher is Miss Jody, my afternoon teacher is Miss Debby, and Christina is there all day. Some of the kids from last year are gone because they moved to first grade, but some of my four- and five-year-old friends are still there, and there are some new three-year-olds, too. I'm really happy to go to school again. I can't wait to get to work! Mommy took me to Value Village to shop for a Halloween costume. Very quickly, I saw a cute witch costume and said that's what I wanted to be. Then I saw a Spider Man costume. It had big muscles and a full face mask, and I begged her to get it. Mommy was reluctant. Instead, she found a zip-up dinosaur costume. It was only $7, and she said that I could get that instead of Spider Man. 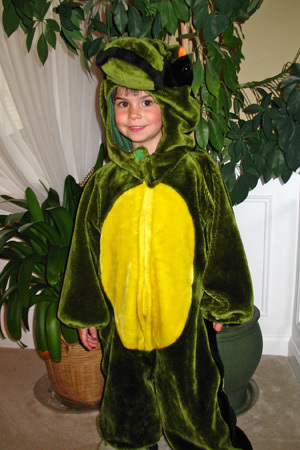 I agreed because I've always wanted a dinosaur costume! Ever since we came home with it, I've been putting it on almost every day [left]. Mommy even made some special feet to go with it. Grrrrrrrrrr. Dressing up is fun! On a Friday off from school in October, Mommy took me to the Imagine Children's Museum in Everett. I served pizza and ice cream in the cafe, made money in the bank, sang and danced on the stage in the theater, climbed a mountain, read a book in the treehouse, milked the cow and shopped for healthy foods at the farm, flew and served snacks in an airplane, and climbed on a fire truck. 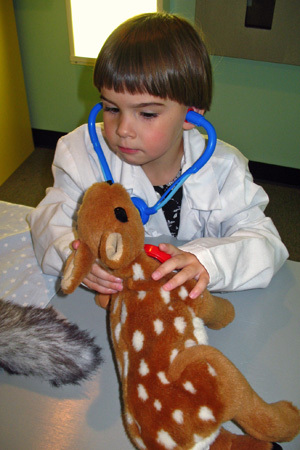 One of my favorite places was the veterinarian's office, where I put on a lab coat and examined some animals [right]. After we ate lunch in the basement, I also played in the playground on the roof. I hope I get more Fridays off so Mommy can take me back there again. On the Saturday before Halloween, Mommy, Papa, Cameron, and I went to the South 47 pumpkin farm. There were animals to pet, hay mountains to climb, and lots of different kinds of pumpkins and gourds to look at. 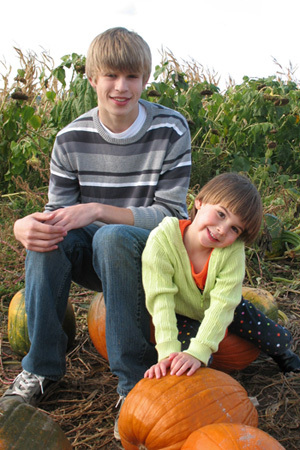 We took some photos among the pumpkins [left], and then we got in line for the hay ride. That was really fun. The tractor pulled us in a big circle around the farm, and halfway around the track got really, really bumpy. It was like being on a pumpkin farm roller coaster! On Sunday, we went to the neighborhood Halloween party. I played spooky games, made crafts, ate food, and jumped in an inflatable room. (I love those.) It was a really warm day, and kids in all kinds of costumes ran around the back yard playing tag. Later that afternoon Cameron and Mommy carved pumpkins. I had already carved mine the previous week at the Montessori pumpkin party, but I did make a Mr. Potato Head pirate pumpkin (I pushed the face pieces into holes in the pumpkin). Mommy's pumpkin was a little scary. Cameron's was really goofy. 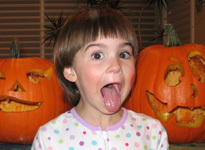 I tried to make a goofy pumpkin face, too [below]. Halloween was on a Friday, and I had no school. 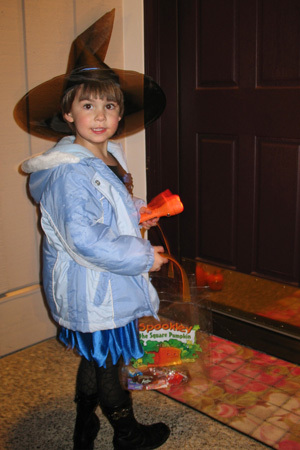 So in the morning I dressed in my blue witch costume [right] and went trick-or-treating at Grandma’s retirement home. I walked door to door on all four floors, and lots of grandmas came out and gave me candy and exclaimed about howcute I was. Some of them just left a basket of goodies outside their door; Mommy made sure I took only one. Even so, I went home with a bag full of candy. That night we had toasted cheese sandwiches for dinner, and then I dressed in my costume again. It was so warm out that I didn’t even have to zip up my jacket [left]. I was so excited running from house to house! About halfway through the neighborhood, Joseph and Steven came out to join me. Joseph was a fireman and Steven was dressed as Batman. We raced to see who could get to each door first. After we were done in our neighborhood (about half the houses were dark with no candy! 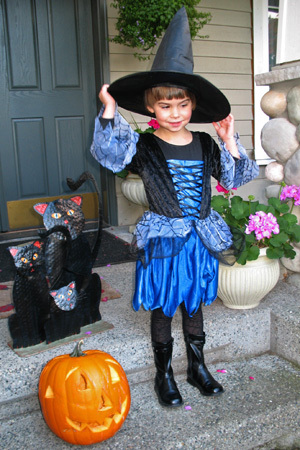 ), Mommy took me to Mr. Scott’s house to show him my costume. He was really nice and gave me handfuls of candy! We walked to a few houses innear Cameron’s other house, and then it was time to go home. By that time my bag was so full, and I was so tired, that I asked Mommy to carry the candy. Hey, once again I ask, where did all that candy go?…. I spent a lot of this Thanksgiving playing quietly with toys. Mommy was busy making food all day and kept saying that I was being very good. I guess I needed some quiet time. Mommy brought Grandma to the house at noon, and Cameron came over from Mr. Scott’s at 4:00 (he’d already eaten a whole meal!). When we finally ate dinner, there were bowls and bowls of food. I refused to eat the sweet potato mousse, mashed potatoes, stuffing, or cranberry salad, but I tried the turkey roulade and ate frozen peas, a roll, and pumpkin bread. It was enough to earn me a special dessert: a frosted turkey cookie.